With no resolution to the crisis in sight, the damaged facilities at Fukushima continue to pump massive amounts of nuclear radiation into the surrounding environment every single day. So will much of northern Japan end up being uninhabitable due to nuclear radiation? Everyone agrees that the area immediately around Fukushima will be uninhabitable indefinitely. The only question is how large of an area around Fukushima is eventually going to be considered unlivable. This week authorities in Japan finally raised the crisis at Fukushima up to a level 7 disaster on the international scale. In fact, they are now telling us that the total release of radioactive material will likely surpass that of the Chernobyl disaster. Chernobyl was incredibly nightmarish and there are still vast areas around Chernobyl that are basically uninhabitable. But Chernobyl only burned for 10 days. 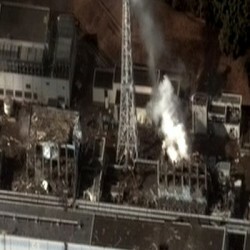 The crisis at Fukushima could end up lasting for many months. Keep in mind that radiation is cumulative. Every single day the total amount of radioactive material that the world is dealing with because of Fukushima just continues to increase. It would be hard to overstate how much of a disaster this will eventually be for Japan. At this point it seems clear that those that lived within the 30 km evacuation zone will never be able to safely return to their homes. But what about the rest of northern Japan? Already there are indications that areas beyond the evacuation zone will soon be unlivable as well as Stephen Lendman recently noted…. The health effects of the various kinds of radioactive material that are being released at Fukushima should not be underestimated. Just consider what Dr. Russell Blaylock recently told Newsmax…. When we look at Chernobyl, most of West Germany was heavily contaminated. Norway, Sweden. Hungary was terribly contaminated. The radiation was taken up into the plants. The food was radioactive. They took the milk and turned it into cheese. The cheese was radioactive. That’s the big danger, the crops in this country being contaminated, the milk in particular, with Strontium 90. That radiation is incorporated into the bones and stays for a lifetime. So would you like to have radioactive material in your bones that affects your health for the rest of your life? Do you want to live every day in fear of what you are eating? Those are the kinds of decisions that residents of northern Japan are going to be facing. Some “experts” on the mainstream media have been downplaying the health risk from nuclear radiation, but the truth is that there is a world of difference between “external radiation” and “internal radiation”. In a recent article for The Guardian, Helen Caldicott, explained why internal radiation is such a health hazard…. The entire food chain in northern Japan is being absolutely soaked with radioactive material. Anyone that eats any food produced in northern Japan from now on is going to be taking a very serious risk. That also applies to any seafood produced in northern Japan. The Japanese seafood industry is going to be absolutely decimated by all of this. Authorities in Japan recently told us that 11,500 tons of “moderately radioactive” water were going to be purposely released into the Pacific Ocean. All of that radioactive material is going to be in the Pacific food chain for generations. Seawater near the facility at Fukushima was recently measured to contain 7.5 million times the legal limit of iodine-131. Anyone hungry for some fish? But iodine-131 only has a half-life of about 8 days. Some of the radioactive material being released at Fukushima has a much longer life span. As I wrote about recently, radioactive cesium-137 is being released at 60% of the level that it was being released at during the Chernobyl disaster. Cesium-137 has a half-life of approximately 30 years. That means that all of this cesium-137 is going to be with us for a very, very long time. Not only that, authorities in Japan are now admitting that strontium is being released into the environment at Fukushima…. Slight amounts of strontium, a heavy radioactive metal that could lead to leukemia, have been detected in soil and plants near the crippled Fukushima Daiichi nuclear plant, Japan’s science and technology ministry said on Tuesday. And perhaps most deadly of all, the plutonium being released at Fukushima is going to contaminate the environment pretty much forever as Kurt Nimmo recently noted…. The alpha emitter plutonium is especially deadly. Plutonium 239 has a high half-life of around 24,000 years. Plutonium transforms into americium and enters the water table. It can contaminate a water supply for centuries. What we are doing to the earth is beyond criminal. When people talk about the possibility that northern Japan could end up being uninhabitable they are not making things up. Remember, radioactivity from Chernobyl deeply contaminated 77,000 square miles. So how long is the crisis at Fukushima going to last? Well, there is at least one nuclear expert that claims that it could be 50 to 100 years before any of the spent nuclear fuel rods at the Fukushima complex will cool down enough to be removed from the facility. That is a very, very long time. And the truth is that every single man, woman and child in the northern hemisphere is going to be exposed to radioactive material from Fukushima. Already, radioactive iodine-131 from the nuclear disaster at Fukushima has been found in seaweed in Puget Sound. Our authorities are trying to keep us calm, but the truth is that significant amounts of radioactive material are getting into the U.S. food chain. According to Natural News, alarmingly high levels of radioactive material from Fukushima are being found in U.S. milk samples…. In Phoenix, Ariz., a milk sample taken on March 28, 2011, tested at 3.2 pCi/l. In Little Rock, Ark., a milk sample taken on March 30, 2011, tested at 8.9 pCi/l, which is almost three times the EPA limit. And in Hilo, Hawaii, a milk sample collected on April 4, 2011, tested at 18 pCi/l, a level six times the EPA maximum safety threshold. Try not to think about the possibility that there may be radiation in your milk the next time you have a glass. Amazingly, U.S. workers are actually being recruited to go over to Japan and work at Fukushima. The pay is apparently very good. You just might not live long enough to spend much of the cash that you make over there. This crisis could end up being a death blow to the Japanese economy. Already it is being projected that approximately 5 million new vehicles will not be built this year because of the crisis in Japan. In fact, Toyota is warning U.S. car dealers that there could be significant shortages of new vehicles this summer. That means that if you want a new Toyota you better go out and grab one while you still can. So could the crisis in Japan get even worse? The truth is that the area around Japan is incredibly seismically active right now. Since the original earthquake back on March 11th, Japan has experienced over 980 aftershocks. In some areas of Japan there are moments when you can literally see the ground moving. The video posted below absolutely blew me away the first time that I saw it. In this video, you can actually watch the ground in Japan move. Trust me, this video is worth a couple minutes of your time because it will absolutely blow your mind….